We offer ideas to keep your non-locking Toyota Tacoma tailgate from being carried away. Tailgates are easy to remove if they are not lockable. Most Tacomas in use today don’t have any tailgate lock that prevents them from being easily removed. A thief can remove it and take it away quickly and easily. There are two ways to reduce the chance this will happen. One is free and takes less than 2 minutes, and one is a bit more involved. The free way to secure the tailgate to your Tacoma is to simply use a hose clamp. This method works on other trucks as well. 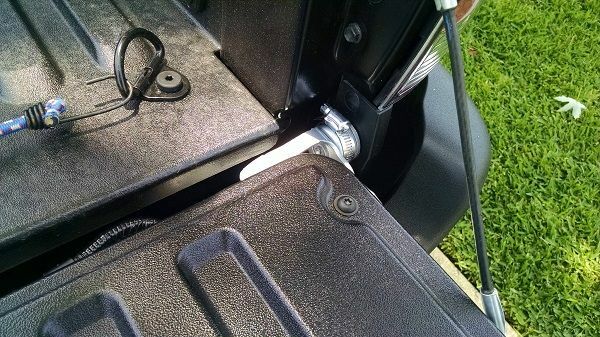 The hose clamp can be installed without taking the tailgate apart. This method will not prevent a determined thief from removing the tailgate, but the thief will have to use tools and take more time to remove it. Another similar method is to use a plastic zip tie. If you are lucky, a thief will see you have secured the tailgate and move on to another easier target that does not expose them longer than they wish to be. Check out the image at the top of this story. Look for it ini the right corner where the tailgate hinge is. Here is a video showing the basic idea behind this. There are also companies that sell locks that work in this fashion, but be sure to check that it will work with your Tacoma. Another way to prevent your Tacoma’s tailgate from being stolen is to install a tailgate lock that locks the tailgate from being opened. This is a job for the experienced do-it-yourselfer. The lock replaces your tailgate handle and it can use your truck's key. FB Tacoma club contributor, Steve Hill, says that it takes about 30 minutes and is compatible with rear-view cameras on Tacomas so equipped. Again, if you are buying a product, be sure it is for your generation. Here is a video showing the installation. If you want to be able to lock and unlock your Tacoma from inside the cab, that is possible. However, the install is again not for novices. The below video shows the full installation being done by a pro. The advantage to this method is a very easy to use lock. If you have a Tacoma now and you have not taken any steps to prevent the tailgate from being removed you have many choices. At a minimum, you can do the easy fix above while you ponder taking further action. We wish to credit Da Niel, contributor to our favorite Tacoma Facebook club, TacomaWorld, for the inspiration and the use of his photo.